The Libyan economy is on the verge of collapse says a World Bank report (Photo: World Bank). ‘’The Libyan economy is near collapse as political stalemate and civil conflict prevent it from fully exploiting its sole natural resource: oil’’, a World Bank report says. ‘‘With oil production just a fifth of potential, revenues have plummeted, pushing fiscal and current account deficits to record highs. With the dinar rapidly losing value, inflation has accelerated, further eroding real incomes’’. ‘‘In addition to near-term challenges of macroeconomic and social/political stability, medium-term challenges include rebuilding infrastructure and economic diversification for job creation and inclusive growth’’. ‘‘Political stalemate continues to prevent the country from realizing its growth potential. Oil production is estimated to have declined for the fourth consecutive year in 2016. Indeed, Libya just managed to produce an average 0.335 million barrels per day (bpd) over the first half of 2016 (a fifth of potential), almost 20 percent less than that produced in 2015-H1’’. ‘‘As a result, the economy has remained mired in recession since 2013, with GDP shrinking by an estimated 8.3 percent in 2016. GDP per capita fell by almost two thirds of its pre-revolution level, to US$ 4,458’’. ‘‘Inflationary pressures remained high over the first half of 2016 leading to substantial loss in real purchasing power of the population, especially given rising basic food prices. Lack of funds to pay due subsidies to importers and distributers of basic food since October 2015 translated into a de facto removal of subsidies to food’’. ‘‘As a consequence, shortages in the supply of food emerged and the black markets prospered, which led prices of food to increase by 31 percent in 2016-H1’’. ‘‘Headline inflation jumped to 24 percent over the same period. It is estimated that inflation will average 20 percent during 2016. Ongoing political strife, low oil production and prices have hit public finances hard’’. ‘‘Revenues from the hydrocarbon sector plummeted to the lowest amount on record at just LYD 3.2 billion during the first 7 months of 2016, amounting to only a tenth of revenues that accrued over the same period last year’’. ‘‘For 2016 as a whole, total revenues are estimated to reach LYD 8 billion, just sufficient to cover projected subsidy outlays for 2016. Spending on subsidies declined by 25.4 percent thanks to lower imported fuel prices and the removal of food subsidies’’. ‘‘Wages also fell by 8.7 percent reflecting efforts to remove duplicate payments from government payrolls through extending and enforcing the use of the national identification number. However, outlays on wages (61 percent of GDP) and subsidies (18.4 percent of GDP) remain very high’’. ‘‘Capital expenditure fell to a seventh of the pre-revolution amount. Overall, the budget deficit remained very high at 69 percent of GDP. 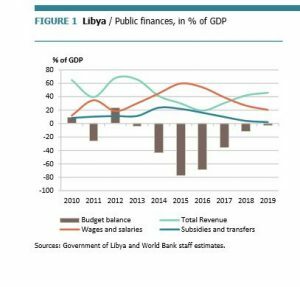 The deficit was financed mainly through borrowing from the Central Bank of Libya and to a lesser extent from commercial banks’’. ‘‘While the central government was a net lender before the revolution, domestic debt has since quickly increased to reach a high 110 percent of GDP in 2016. The balance of payments is also suffering from the ongoing political deadlock, exacerbated by low oil prices. Libya is only exporting 0.2 million bpd of oil this year, which is less than the sixth of potential’’. ‘‘Hit further by declining oil prices, revenues from hydrocarbon exports are estimated to fall by a third in 2016, representing only 7 percent of the 2012 export revenues. Although declining, consumption driven imports remained high’’. ‘‘Against this backdrop, the current account deficit is projected to deteriorate this year to an estimated 61 percent of GDP, the third deficit in a row. To finance these deficits, net foreign reserves are rapidly being depleted. They were halved from US$107.6 billion in 2013 to an estimated US$43 billion by end-2016’’. ‘‘The official exchange rate of the Libyan Dinar (LYD) against the US$ has been stable around its SDR peg, while the LYD in the parallel market lost 73 percent of its value due to weak macroeconomic fundamentals and foreign exchange restrictions’’. ‘‘The outlook hinges on the assumption that the Libya’s House of Representatives will endorse a new government of national accord by the end of 2016, which will be able to start restoring security and launching programs to rebuild the economic and social infrastructures, especially oil facilities and terminals’’. ‘‘In the baseline scenario, production of oil is projected to progressively improve to around 0.6 million bpd by end-2017. On this basis, GDP is projected to increase 28 percent. However, the twin deficits will remain as revenues from oil and will not be sufficient to cover budget expenditures and consumption driven imports. This should keep the budget deficit at about 35 percent of GDP and the current account deficit at 28 percent of GDP in 2017’’. ‘‘However, downside risks to this scenario remain high as the political uncertainties may prevail. Over the medium term, it is expected that oil production will progressively increase without reaching full capacity before 2020 due to the time necessary to restore the heavily damaged oil infrastructure’’. ‘‘In this context, growth is projected to rebound at around 23 percent in 2018. Both the fiscal and current account balances will significantly improve, with the budget and the balance of payments running surpluses expected from 2020 onwards. Foreign reserves will average around US$26 billion during 2017-2019, representing the equivalent of 13 months of imports’’. ‘‘Unless immediate and target action is taken to address the humanitarian crisis, the situation is unlikely to improve. 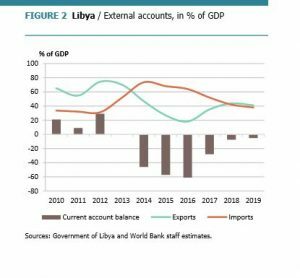 The situation in Libya is such that simply relying on a slightly improved macro outlook is unlikely to bring about significant change. The country needs humanitarian aid and specific programs to address the destruction and lack of basic services that a large part of the population faces’’. ‘‘Immediate challenges are to achieve macro stability while restoring and improving basic public services. Current expenditures need to be brought under control, in particular the wage bill and subsidies’’. ‘‘Over the medium term, the country needs broader and deeper structural reforms, inter alia by improving tax revenues, enhancing the management of public financial and human resources, launching civil service reform, and promoting the development and diversification of the private sector for job creation’’. ‘‘Inclusive growth will require not only substantial increases in investments on key basic services to rebuild human capital, but also interventions targeted to the poor and the bottom 40 percent to restore the welfare of the population’’.